The “Preface” directly below, followed by the most recent updates from 30 – 26 May 18 from Carol Woods. What “luxuries” [eg. like getting away with crimes] or how much money has been “given” to any of these criminals so as they can harass – and even attempt to kill – Carol when she has been out driving her car, or elsewhere? The posts here, each one copied from Ms. Wood’s own communications show the outrageous hostilities happening to her which continue to this day – the archive made of scores of posts beginning in Febuary 2016 after certain “supporters” found out Carol had been placed in a closed mental hospital unit for the 5th [at least] time for no honest reason. 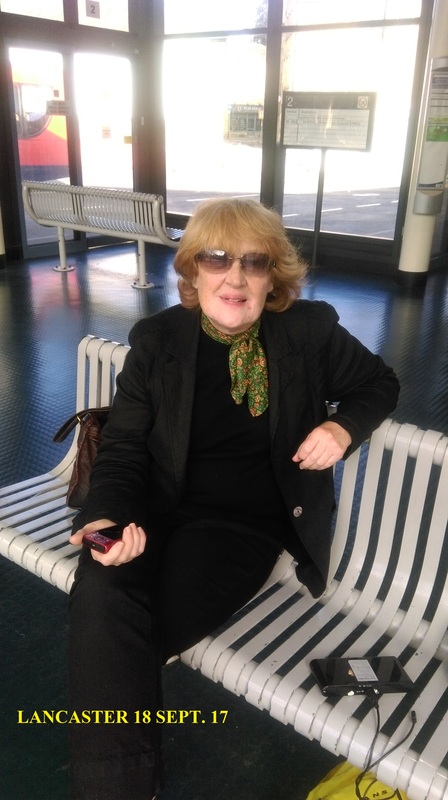 On January 31st this year – 2018 – Carol was falsely arrested by Lancs. police for being myself – the owner of this site – for allegedly posting articles here – a nonsense charge easily contradicted by my affadavit / statement as sent to Lancs. police [the statement can be seen in the recent related post put here recently], but nevertheless this unwarranted arrest causing more unnecessary hassle for Carol – the point of the exercise, I for one very strongly allege. Carol has been falsely convicted in the past on the most rigged of charges. Dear Sirs. The hysteria mounts in my area and the harassment is intense and manic. 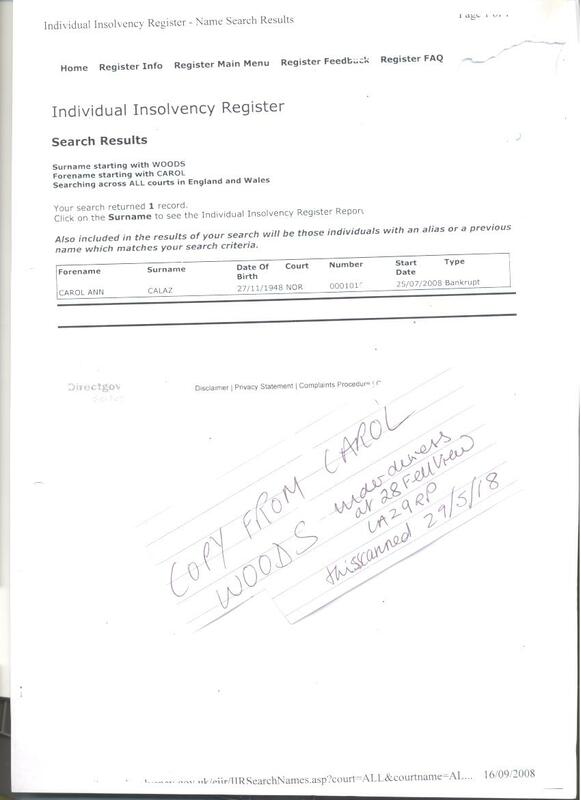 The recent documents I Ms Carol Woods sent out about the THEFT WRECKING and LOOTING of my house are some of the cause. I am to be made to forget or made into someone invented! The constant lunacy in revision history goes on and I add today that at least 5 FIVE idiots sent to drive up and down outside me in 28 Fell View LA2 9RP were then found ALL to be at 36 Fell View Jackson more thieves and fraudsters who have used AGNES JACKSON the same type of thief etc in 26 Fell View to pose as me, she in that to be ‘mother’ of Jackson in 36 when they are not related. Thus YOU funded the expense which has gone to parasites and thieves in 36 Fell View after 24 others have all been used the same as I live in at least 24 houses apparently as Mrs Invisible; no one works, they all have their FREE MONEY provided by you and not a murmur from one of you. They needed “new items” for the Mrs Invisible moving in AFTER SHE “LOST HER HOUSE”. Me in other words, from 2008 but not May, Oct 2008. As if I’d go to live with such who all took part in bullying to death the elderly lone lady in 28 Fell View so that it became “free” for me to move to. Yesterday I noted harassment as I walked back to my car after the hours of such in Lancaster town, one item was a) the Gestapo always just on hand to confirm they see what their delusions allow, b) train tickets placed along my route like Hansel and Grethel’s crumbs, as proof I was someone just moving from somewhere else c) a scruffy male in a white shirt was involved and he was to make me forget the fraudsters attached. One photo taken when I rented at 298 Oxcliffe Rd LA3 3EJ (3/4/12 – 1/7/13) and my car parked at the roadside and not seen from the caravan I rented; thus I go to my car by chance and see a lump of a white shirted male, who was pretending to be with me at 298. This is the usual of being seen near my car so PROOF of whatever is fabricated. I challenged him and he ran off; notice his file; that is the “officialdom” farce. Thus he has to be covered for and I have white shirted males harass as routine. 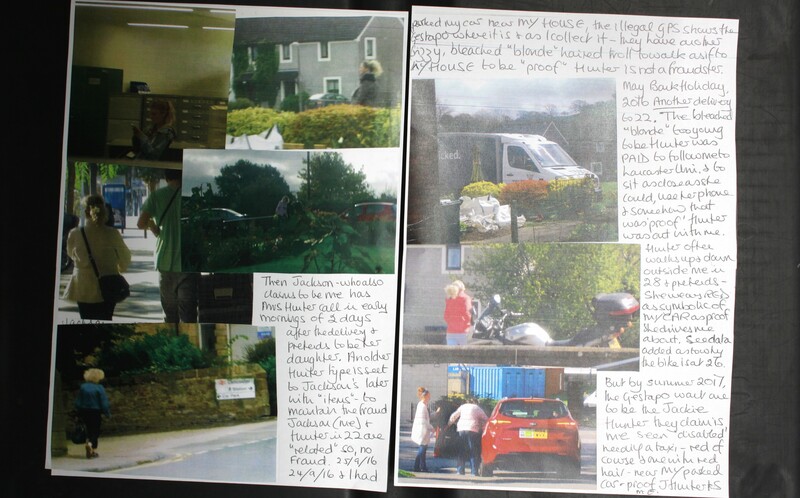 The 2nd photo is of 3 from THE COUNCIL who expected me to be in Lancaster 1/7/14 after I had moved to Fell View on 24/3/14, ILLEGALLY it was known I was to re-insure my car and they assumed I’d stay in town where they could claim I was seen so it was proof of something but what? The 3 are stood near the COUNTY COURT; one thug is JIM UNDERWOOD who bears a grudge after I exposed him as a proven liar in 2006 in a council tax tribunal which I won as a land-mark ruling. The others I do not know. They INTENDED to claim they had been IN COURT as the MANAGEMENT GROUP who claimed to have gained MY HOUSE and then sold it. I drove right through town and past them getting my photo and then finding they PLANNED to meet with Mrs LENA CURWEN of 24 Fell View thief and fraudster who claims to be me and who GAINED £50.000.00 as me in an RTA of which I have never had; nor has she. Mr MAURICE CURWEN stalker and pest is in 24 from time to time but mostly it is left unoccupied as YOU fund their second address where they live as “disabled” when neither is. 24 is often used in E-Crime and I have many photos for any inquiry. That of 1/7/14 was spoiled as I drove to another town for a day out. The next doc is a letter from Revenues, a Mrs McGurk 18 Dec 2008, one who wrote well to me, not the usual bullying troll and liar. She states what is SEEN, so, is someone going to say I imagine this or make it up? 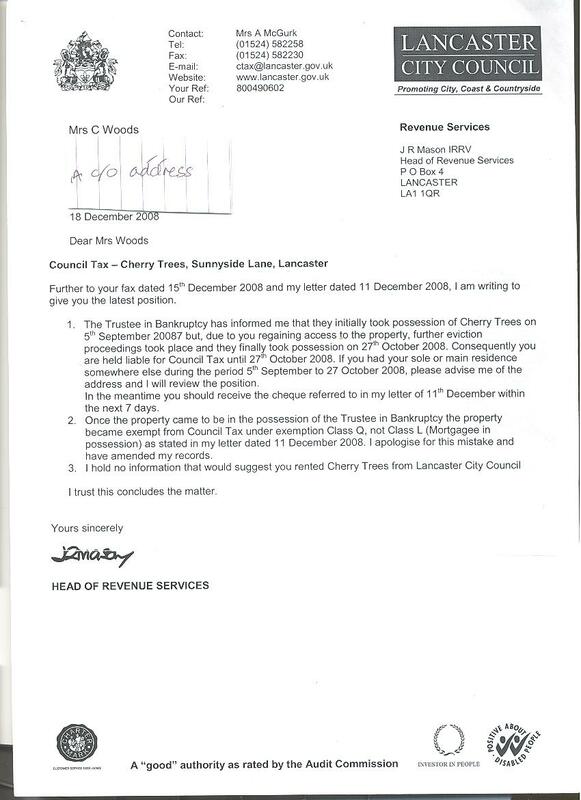 She states in black and white that the TRUSTEE in BANKRUPTCY seized my house (Cherry Trees) 5 Sept 08 but I regained it so he seized it again later etc. One can only wonder why they wrecked it knocking £70.000.00 off its value in 2 hours. This is the cover up in EXTORTION, FRAUD, ID THEFT, DEMAND MONEY WITH MENACES, PERJURY and more and what MIKE TODD found from 2006 to end 2007 with a file of mine he had sent to him by a real judge seeing my case to that point. That was why Mike Todd was murdered; he was prosecuting. The Masonic thugs in Lancs will have been doing this for decades and stealing assets, land, property leaving victims wondering what went on. Please feel free to quote me: as data subject I own the copyright and publishing rights to all. Ends Carol Woods Ms under duress at 28 Fell View LA2 9RP where I am at least 24 others, sorry I have no phone, I leave all those others to use theirs and pretend to be me. PS checking the web site, one would see if any names similar to ones own were registered; this is why the Gestapo have tried to make me those with names to be “confused” with mine. AS the months went by and I and neighbours continued to print those registered, the name Caroline came up and such like thus ALL those round Fell View as KARLEY, KIRSTY, CAROLINE etc and those given MY ID such as Jarvis in 41, Williams in 30, Jackson in 36 are all to be so that I am someone else. I guarantee they do not have my files. Dear Chief Executives, This is sent and cc others as there is a thought that I complain about the murderous thieves and fraudsters I am obliged to “live” among around Fell View LA2 9RP when that is not the FACT. The FACT is that they are organised and all gain. Thus a brief overview of today, same as any other day is recorded: 1) lowlife collect at 36 Fell View thieves and fraudsters and LINDA JACKSON with the Jackson unemployed-for-ever yob claims that “someone” moves in to 36 which person is ME to be LINDA the supposed daughter of the elderly lone lady bullied to death in 28 prior to my move in. That lady had no daughter and the lowlife in 36 was/is nothing to do with either her or me. The yob has aided AGNES JACKSON in 26 to pose as me by he shaving his head to hide the FACT that he has dark hair and thus is no son of mine and then the pair going out as mother and son, Mr and Mrs Carol Woods – me in fact – on photos. I took photos of the lowlife who had spent the morning driving up and down in front of me to make me think they were driving me (we deal with demented halfwits) and to 36 Fell View. A farce in progress at tax-payer’s expense went on at 39, O’CONNER trying to rewrite photos of mine from 2013 at 2 earlier addresses of mine. O’CONNER claims to be me as her identical twin as well as A Jackson in 26, June F Williams in 30 et al; they ALL each have an identical twin apparently and they are ALL Carol Woods, me. O’Conner I have reported for stalking me after hiding for that purpose in her car Y547 OGW (all cars silver grey unless noted and ALL to be YK02 VPF the car of ANOTHER lady bullied to death Mrs M Porter Flat 3 Penhale Gardens LA3 3EJ when I then moved in and found out what really goes on in Lancs.) O’Conner has done this often and caught out thinks she is above the law so continues. 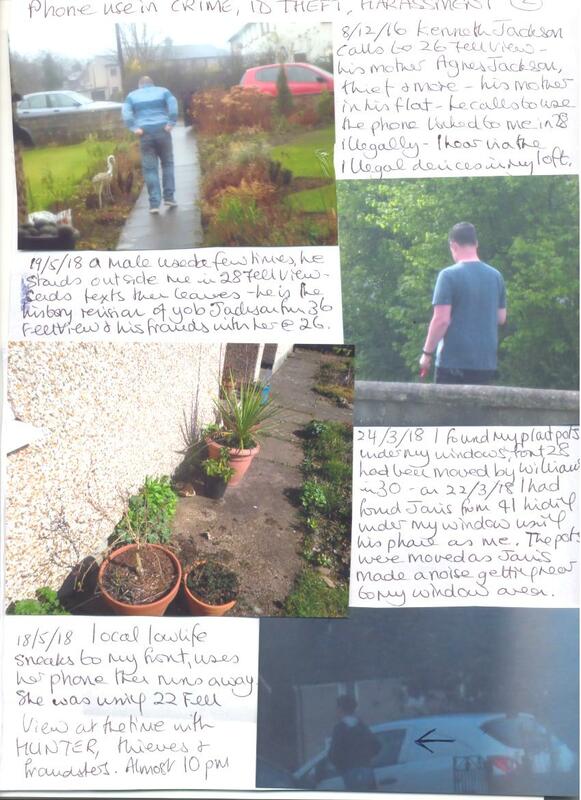 I also reported the thief and worse in 43 Fell View McHARRAN (E-criminal as proven) as she was to take over from O’Conner when it was seen I had filmed o’Conner as hiding to stalk and then attempting to stalk – ALL AS INSTRUCTED. Who funds their petrol costs?What does it achieve? Other cars used with pairs to be the 2 from 39 Mr and Mrs cars, red and silver grey, thus I had EO57 LNE and GJ60 UEO, among others, including such masonic thugs as window replacement vans (all to make me forget MY HOUSE) PE62 LYX and so on. Parking in a spot I do use occasionally I found the usual sleazy council waiting to pull out to leave me space to park so that 3 THREE other sleazy council PAID AT TAX-PAYERS EXPENSE could then creep off in their cars “hidden” and pretend whatever their delusions allowed; all silver: all to be YK02 VPF cover up, PF63 JJX, ?J51 YOP, PE05 NLY and all filmed. ANOTHER van waited, WJ65 BGY was another to “drop off someone invisible” (me) and a silly troll waited hiding to then set off dragging an empty suitcase to be ME LEAVING MY HOUSE way across the town! She on photos was nothing like me to look at nor intellectually, imagine what moronic heads agree to take part in such lunacy. The use of those in ‘yellow’ and phones and harassment in the library yet again is noted and some on camera: and the white shirted thug to hide along the route I drove and to step out of hiding will also be sent out as to what he thought he was doing. Someone pays the thugs in the Blackpool maintenance firm NHS firm ATLAS to harass, well quite honestly if it makes those weedy specimens feel like real men to stalk to harass, I think it is tax-payers’ monies well spent. I will CC this to COUNCIL TAX and BENEFITS as the fraudsters in 36 NOW will make a claim in FRAUD, FE11 OBN male who always drives Mrs Invisible to live in 22 Fell View which Mrs Invisible is always apparently me, arrived to drop her off again yesterday as they miss their FREE MONEY and EXTRA CARS. 41 Fell View we know of and they also have an invisible person who seems to be me given the stalking and lunacy of those JARVIS thieves and fraudsters, 20, 23,12 and 14 again and reported as stalkers and harassers to the Gestapo who will ignore it but we need to see if they make a claim for their invisible person yet again. I add 5 and 7 Leslie Ave off Fell View again as they drive to stalk to pretend they drop me off in that corner of thieves and fraudsters. I am sure more will emerge in the next few days as they ALL MISS THEIR FREE MONEY and just think, they might even have to get a job or at least pretend to look for one. Yours etc Carol Woods Ms this on record now. Dear Mr Gallacher, today MORE lunacy is in full swing found Fell View and the wider area:ALL this is on film so do ask if you want the photos scanned and sent out. 1) Events at 36 FELL VIEW and harassers, thieves and fraudsters JACKSON one a LINDA JACKSON who is ANOTHER to claim to be my daughter. She with the unemployed yob there aided for at least 4 years (and still do in part) AGNES JACKSON in 26 NO RELATION but she pretends to be me with the yob and LINDA JACKSON in 36 posing as MY son (using A Jackson in 26 to be the “mother” me) and daughter. They are having expensive items for 36 while both are long term unemployed so, who is paying? The tax-payer. Today no fewer than 5 cars parked to pretend they dropped off “someone” (to take advantage of the purchases) at 36 after driving up and down outside me in 28. I filmed them all. This I will report to the Gestapo as well as we have ID THEFT and more crime on our hands. 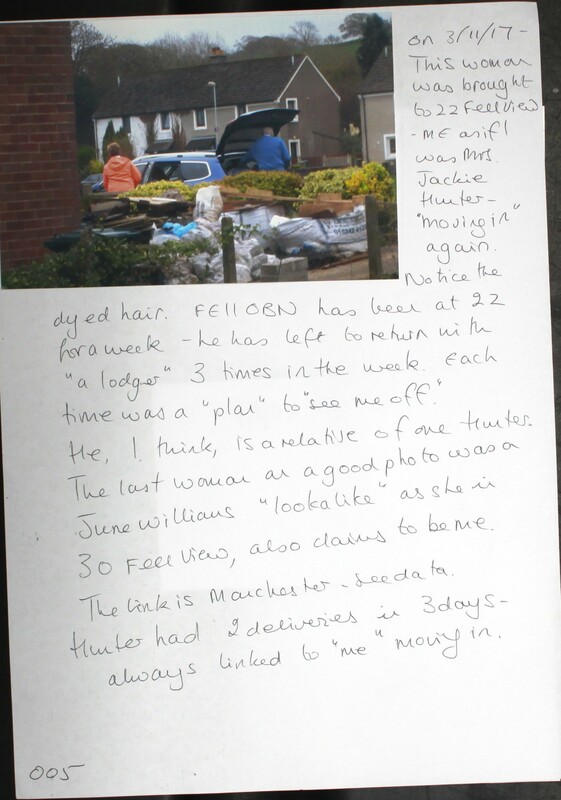 2) The old male in FE11 OBN was sent to 22 again yesterday after months of not being sent: he pretends he drives a “someone” from MANCHESTER area who they claim is a) Mr Hunter’s mother, b) Mrs Hunter’s mother, c) Mrs Hunter claims is herself, the person is me apparently as a Mrs Hunter of Shaw OL2 REX. I will cc you the photos of the profile of those thieves and fraudsters. Notice the final photo of one to be me with her dyed hair. Please note that I now report to the Gestapo the thieves and fraudsters from 39 and 43 Fell View who have claimed and claim WITH CARS ETC to be me and stalk to pretend they with my car are me. You need to look at 12, 20, 23 as well as they have had invisible persons move in there as have those in 41 Fell View, JARVIS. to andy.rhodes, me, bae146, info, bob.gallacher, graham.farrant, ministers, policing.minis. I sent the email below earlier today and as usual, sent the Gestapo a reminder that they have not sent me my custody records from 31 Jan 2018 harassment and thuggery. The thuggery includes AGAIN the INTENTION of manufacturing “evidence” I have just moved and to ONE of these addresses below in the MOORLANDS area of Lancaster and am not me. I guarantee that they claim I have just moved from 298 Oxcliffe Rd LA3 3EJ again and move to the Moorlands area with the lunacy of pretending I am someone else such as the FRAUD in PAYING the rent at 298 since I left 1/7/13 to pretend I never left and am someone else where I have rented since. This then to the ICO as we clearly have breach of stringent new data protection rules. How do they try to manufacture the FRAUDS? They have the usual scum floating as I leave town to get to my car parked not far from the Moorlands area. I waited for a few minutes which puts their scum out of time for “events” which included; a horse faced troll with ginger hair caught in the SANTANDER BANK FRAUD POSING AS ME, I have no idea of her name but she is unemployed and rough, she was to stand about with an Asian man and pretend she was me with a grandson on photos seen illegally by the Gestapo. Is my grandson Asian? No? is he nearly as old as I am? No. I ignored that roughneck. Rushing from Moorlands area was a seedy old man in scruffy white shirt to be the fraudster I found outside 298 Oxcliffe Rd when I rented there, he stood at MY car pretending he was meeting me about MY HOUSE! The photo of that thug and his lime green car are why the troll is sent to park at 33 Fell View in hers and that I am to forget the fraudster on photos at 298. But the Gestapo use a horrendous old woman and they pay her to travel from KENDAL, almost illiterate and mentally ill, shouts in the library and she they claim is me when they are desperate to give me a Kendal link; why I have no idea. She is not here looking around; the library open to 7 today and the lowlife all sent to pretend one is me have gone. I left then saw the thuggery and returned to get it on record as it is on photos. After I took a photo of the scruffy male and his scruffy white shirt I saw the Gestapo had planted at least 6 train tickets as if someone had just dropped them or disposed of them, the someone would be me moving from somewhere else. I took a photo but the towns are not highly visible so, it is anyone’s guess. Instead of the ICELAND thug they swapped for a SAINSBURY and he would confirm he saw me and thus the tickets were mine. But then the Gestapo thugs had to drive along to confirm it further, they see me, they then amazingly find the tickets and 2 + 2 = 5 again. At my car they had the usual rough type of a Fell View thief and fraudster HUNTER in 22 where I also apparently live, this one only had hair of straw like Hunter but is a type used. She of course stood next to my car sending texts. I of course happened to take a photo of which she is in the frame. Then I drove round the town, parked near the train station to help them out and returned to the library and send this. There you have it; aiding and abetting of murderous lowlife such as many round Fell View. The letter below was written in hand on hand done paper (given the lunacy in sending out drivel as if I wrote it) and for Chief Executive Lancaster City Council and benefits section. Given the harassment and thuggery of last week AGAIN on every single day, all day, I add that ELY unemployed thieves and fraudsters 12 Fell view were ILLEGALLY given my details as to where I was yesterday so that lowlife could drive behind me and pretend they drove me to 12 Fell view LA2 9RP as they are 1 household of parasites and worse who miss their FREE MONEY gained from March 2014 when I moved to rent 28 Fell View when ELY and 23 OTHERS TWENTY THREE parasitical households all claims that I had moved in with them and for that they claimed from then to recent and no charges pressed for FRAUD, FORGERY and so on. Only 3 days earlier it had been the same type of lowlife from 14 McGuire to do the same as I also apparently lived there; today it was more from 17 Langdale who I apparently also lived with as total strangers, that backs on to the even numbers of Fell View, ALL THIS IS ON HUNDREDS OF PHOTOS. 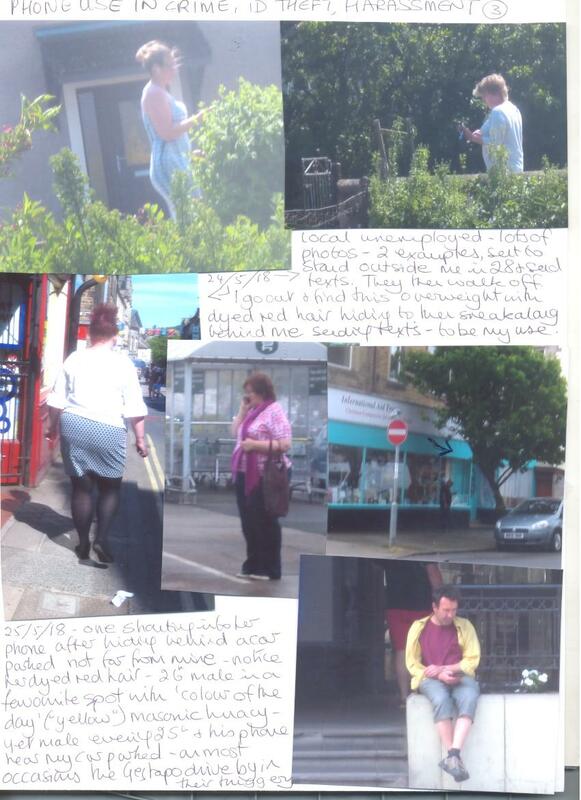 Notice the ICELAND FRAUD yet again and one from Iceland sent today in a line of 4 to stand along a route I am ILLEGALLY seen to walk as usual, where those yobs send their texts to the next in line so they can stage whatever lunatic event is required as I walk into the town. I ignored the seedy old trolls who were to be my dead mother. Without recording all here as to lowlife WHO ALL TOOK PART IN BULLYING THE DEATH THE FORMER TENANT OF 28 FELL VIEW SO I COULD MOVE IN (I guess all the seedy old trolls they find now are to be that old lady bullied to death so they can say she is not dead and was/is my mother!) I only record this which YOU have all paid for. It suits now the lunatics in power to claim I am still at 298 Oxcliffe Rd LA3 3EJ which address I left 1/7/13 and for that to take place they arrange events to brainwash in the inept, childish lunacy hoping I think I am at 298 Oxcliffe Rd which was a small scrap yard in semi-use with an old tractor and 5 ancient former holiday caravans rented out as “homes”. I rented 1A. Yesterday the Gestapo had a male park a small tractor outside 18/20 Fell View where he went to hide for at least 2 hours so he could set off when I went out; then he sets off and I see and think I am at 298 miles away! The use of phones and thugs in cars bigger than their IQ’s will ever be went on all day to pretend I met with one to SELL MY HOUSE. 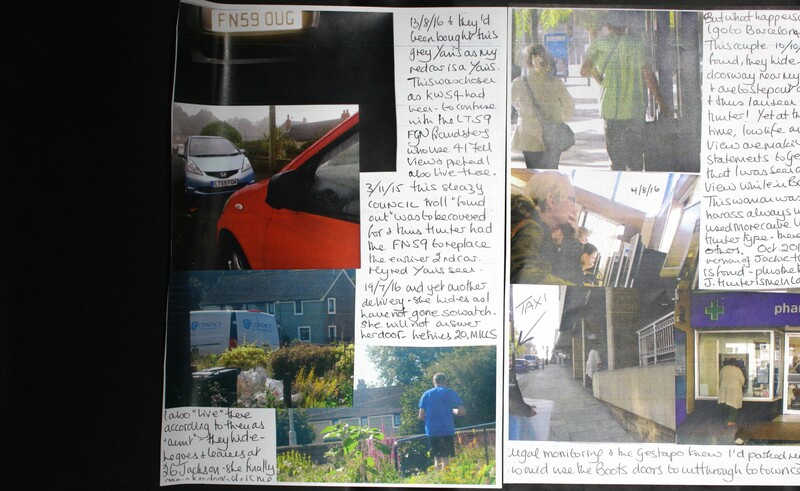 In that all on film, the council even had a troll used in a blue Mazda, FP03 XKB (imagine what she would be paid for Bank Holiday FRAUD which they would claim was “work”) to be T19 MAP a 2 seater used on 4/2/14 and sent to Caton to pretend that old thief and fraudster met with me to sell my house. I was to see the council (council car park badge in windscreen which was a clue) and forget the old thief in T19 MAP. The brainwashing over days was to lead to ANOTHER arrest for following someone (only a crime if they claim I follow, not a crime for the lowlife stalkers) who was AGAIN the deranged thief and fraudster JARVIS paid from March 2014 in claims that I lived there and was driven about by her. FOUND OUT they now want to claim she is a ”victim”. She has done this numerous times, some on film, she waits by their front door where the car GN07 AHO is parked right up against. She waits to see me walk to my car which takes 2 or 3minutes as I have a garden path to walk along after locking up and my car is along the roadside. In that time she runs to set off and then screams I am following her in my car as I would clearly be behind here; on one occasion she doing that, I waited 7 minutes before driving off and found she waited for me to then set off ahead as she saw me approach. That would be an arrestable offence and the Gestapo want it to be for 31 May 2018 to be 31 Jan 2018 again (which they pretend did not happen). BUT THE COUNCIL HAS BEEN PAYING THE LANDLADY AT 298 MONIES TO PRETEND ALL THIS TIME THAT I NEVER LEFT AND THEY PAY HER AS IF I AM SOMEONE INVENTED; MY GUESS IS “MRS CAROLE WOODS”. The lunatics in this do not understand that if I do in fact still rent at 298, which is about 9 miles from Caton, then it is unlikely I would see Jarvis set off from 41 Fell View in order to then intend to follow her. I will just note here, that all my formal complaints in regard to Misconduct in a Public Office are ignored: Tony Fox, Rachael Harland, Ian Lockley, Amanda Gervaise, Helene Trevelyn, David Watamough at least. (All from July 2013.) The Gestapo use other addresses and claim, often by being present themselves, (e.g. 26/5/18 approx 6pm Moor Lane/Williamson Rd area, Lancaster), that I use them as addresses in FRAUD and use them to collect “delivered goods” such as Iceland on 26/5/18. I film all such lunacy. That delivery was to 12 Williamson Rd, used often when I park in the area as do many others so, I ask what benefits I claim to pay rent there, council tax and so on, and in fact what name I use to claim, date of originating claim also required. 30 Williamson Rd with a rough old woman, Gladstone, is also used. She is also apparently me, so, there have to be records and naturally, in my name with my applications for financial support required. 22 Williamson Rd, currently unoccupied as I only moved out apparently last Thursday, 24/5/18. You must have records as to “me” and “my” claims to have been there to then move out. Often, sleazy council staff in the area “on hand” to help with all the acts of lunacy and I film them all. I have warned I do, and I note car plates to identify them. I also appear to be Pat Morley married to David in The Old Coach House so I need to know when you were told I had ceased being Carol Woods and was Pat Morley of Bath Mill Lane . Are payments made to her/those 2 to pretend in that lunacy? Any reasonable minded person would suggest they do not act for free. I also need all data ditto all above in regard to 3 Bath Mill Lane, Sue De Lecea, who is driven about as me pretending to be picked up after I park, and driven about by someone, there are often sleazy staff hiding in cars parked along Bath Mill Lane who pretend they are linked to me in whichever way their corruption and delusions allow. I have their photos: please ask. Ms DeLecea mujct have something to show she is in fact me; I would like to know what. I add now 3 Woodville St, 9/9A Moor Gate corner of Woodville St and 33 Woodville St at least on there all same small area of Lancaster with “3” being used in FRAUD of pretending she there (a total stranger) was my daughter having indoors, a sleazy solicitor and estate agent who acted as if they were using her to SELL MY HOUSE, (the one with the steel door). Excellent photos of Gestapo always to be conveniently “on hand” to confirm they see all those addresses with all the frauds in place and see my car which is PROOF apparently that I do have all those extra addresses, they must be sure they could prove something to a jury; I require all as above. Signed by me Carol Woods Ms. I resend the ELY FRAUD report to Gestapo with photos who ignored it and simply started them pretending again SO A NEW CLAIM MUST HAVE BEEN MADE FOR THAT LOWLIFE IN 12 AS WELL AS THOSE IN 14. Please note that this is using my cherrytrees2007 email address THE NAME OF MY HOUSE WITH THE STEEL DOOR. This is more in the likely HSBC fraud conducted seemingly in my name. 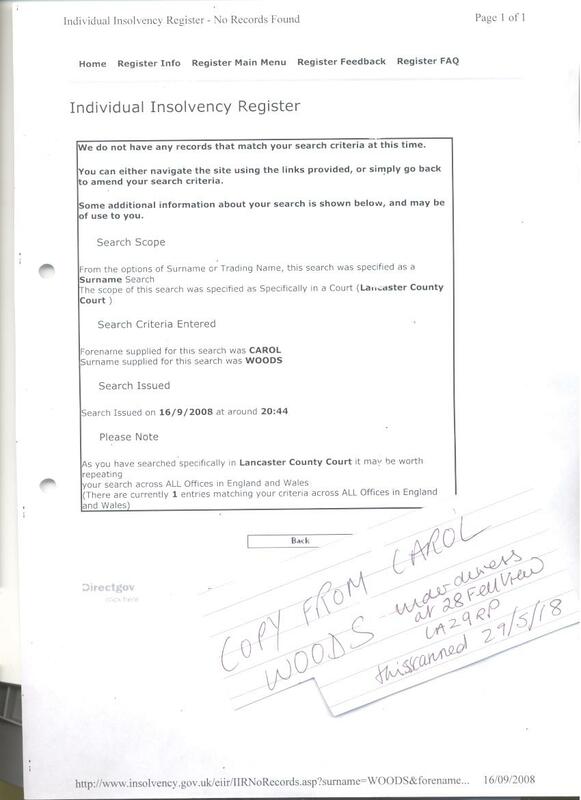 I usually use woodsresearch2002@yahoo.co.uk but use this so that we all know that there are NOT 2 persons involved just the one, ME, with 2 email addresses is regular use. This has been mine and mine alone from 2007. Carol Woods Ms under duress at 28 Fell View LA2 9RP. I thought this could record the fraudsters, stalkers and harassers in 12 Fell View ELY who claimed from March 2014 that I lived there and was driven about by them. All unemployed there and the cars used were personalised plates transferred as each vehicle became larger and more expensive, amazing for unemployed by profession (professional parasites). I have not and never have been KNOWINGLY or LEGALLY linked to that lowlife. which was a staged event so I take this opportunity to record many “55” cars and drives who stalk to harass and pretend and ALL from the old doxy in MF55 VYX found outside my sister’s house in 2011 at least 4 times pretending she met with someone – me as the liar and fraudster the driver was. I list others all intending same or similar here: FULL DETAILS as to make and car colour on request, many on film. I add an * for the significant ones. RY55 NFA, BX55 JCB a Halliday type van used to harass and pretend on 31/10/14. CW55 APY*, DK55 YRV, DV55 RWZ, GN55 JNK*, KV55 WWC (cop I think), KS55 FDN, MF55 MGE*, NF55 XKW, MM55 LNY, OE55 UVO, PE55 UKG, SO55 SOO (bent cop Preston 1/5/14), SN55 DCO*, SJ55* removal van used often to pretend he moves me, VE55 XJJ, YM55 TGK*, YH55 GXZ, YH55 SLV, VE55 XJJ, MW55 ZTT*, SA55 XHD*, SA55 ZNK, PF55 SRX, and today male thinking he was now MI6, SD55 ECY. 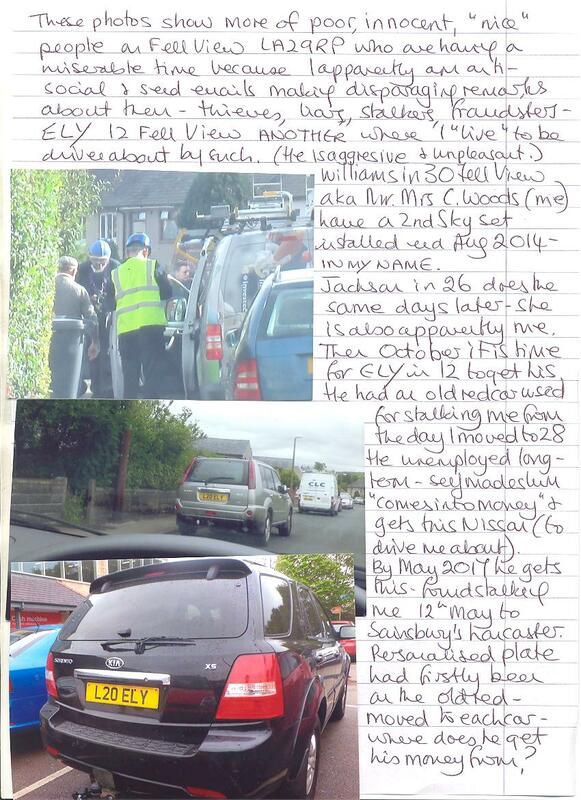 Now we have it on record that those cars are less than nothing to do with me whatever the drivers pretend and, ELY in 12 Fell View is NOT STANLEY ELY from my tribunal claim 2406569/01 a former colleague. to contact, bob.gallacher, ministers, david.gauke.mp, me, bae146, cat_smith, haveyoursay, chiefexecutive, chiefexecutive, policing.minis. Dear Sirs sent this, please see attached pages of photos of phone use and how such is used in ORGANISED CRIME Lancs, mostly arranged by the Gestapo. Most have seen the “court documents” issued to me in THEFT OF MY HOUSE so only the Gestapo acted without legal jurisdiction and as the junk issued to me is proven to be such then I refer to Lancs police as Gestapo (they arranged it all). Most have seen an unemployed yob on photos sent out, he JACKSON from 36 Fell View LA2 9RP where I rent 28 under duress. (Please ask if you would like them sending again). He was to stand outside me in 28 using texting and pretending he sent them to me as he was part of the ID THEFT and FRAUD arranged for AGNES JACKSON in 26 Fell View who the COUNCIL set up to be me. The yob and Jackson (not related, name just “useful”) did then meet up at DWP centre and pretended it was arranged with ME as if she was me and the PHONE use was to be the “evidence”. I do not have a phone at all. Thus more on that line: The first time I realised what was taking place was by a cafe I patronised on Sun St Lancaster where I found every time, males of all types always outside using their phones in texting: some would hide under the cafe windows. 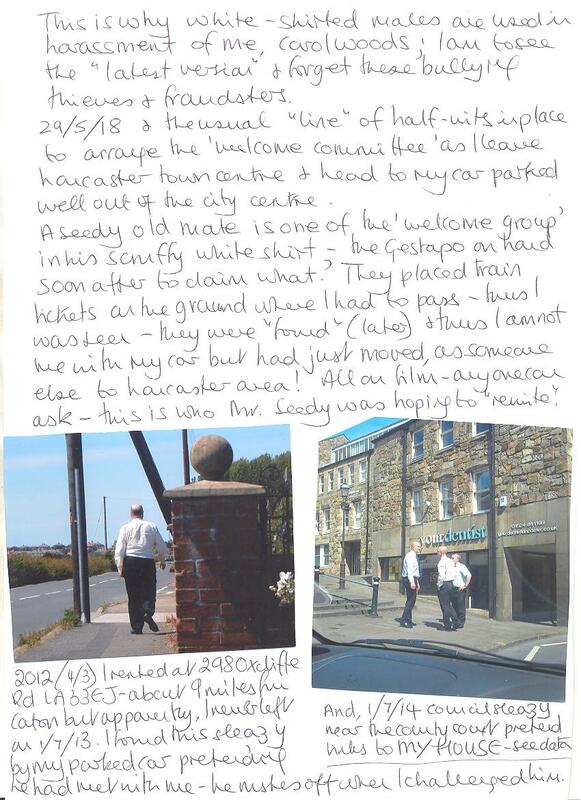 This day 31/5/14 I walked a different route after leaving the cafe fast seeing yet another: and I walked right into MR SLEAZY pub landlord “Mark” who claims to be a solicitor and in that MY SOLICITOR involved in ID THEFT and SERIOUS DWP FRAUD from 2012 where he claimed he represented me with a murderous thug who claimed I was his partner and he wanted extra DWP monies to care for me as I was apparently the murderous thugs partner and “ill”. That found out by chance and this scum still floats. (I was sent the usual half-witted recruit in 2013 to tell me that this “Mark” was possibly only a friend which seemed somehow to ignore the rest! He was not a friend of anyone. I know EXACTLY what had gone on behind my back because the COURT doc came to me to my then address and without my name it got past the watchers.) Here he pretends the texts from Sun St are from me to keep that FRAUD “alive”. HE is why many males used have this facial hair type; I am to forget 2012 events and think all I know is NOW. 20 Fell View and MILLS using her phone in DPD FRAUD posing as me and she shouting as I had not driven off so watched; she had to tell the DPD driver to deliver lsewhere as that was to be a “behind my back” fraud etc. Then long after that reported and ignored (I apparently lived in the squalid caravan dumped on the front of 20 Fell View by the council so she could claim in FRAUD and did for almost 3 years.) To cover for MILLS she was given an alias in 2017 STAIG and I go for a long walk along the shore, at a stopping place for cars I find this one waiting to start shouting into her phone, note the RED car, supposed to be mine which was then miles away as I walked. Notice the male, he had hidden a camera under his hat for when I walked by in this farce, his camera was to catch me and thus proof this woman shouting was me and thus she was Mills which meant I am Mills in the photo at 20 Fell View! The logic of lunatics. 8/12/16 and Agnes Jackson in 26 was in her son’s flat 5 mins walk from Fell View, he called to her bungalow and used her phone, I heard via the LOFT NOISE created via the ILLEGAL devices in my loft installed for such FRAUDS to happen (and they do, my ‘Loft Noise’ document is added to daily, it records those who use phones as me or the Internet which I hear via the devices and have learned to identify who and what they use), looked out and here he is then creeping away, their “evidence” that it was my use was that she was in his flat. 19/5/18 and a repeat of the Jackson and Jackson fraud of 2015. A male who is similar to the unemployed yob in 36 has been sent to stand outside me and send his texts. The intention is to claim it is linked to me to show I have a phone. 24/3/18 and I found that Williams in 30 heard the night before moving my plant pots had in fact done so, he had done that as JARVIS the thief and fraudster from 41 had on 22nd crept to my front window at night and used his phone to pretend as the signal was from outside me in 28 then it must have been my phone. Jarvis had kicked my plant pots which alerted me to more shenanigans and thus Williams from 30 was sent to try and move them so that Jarvis could get near again without being heard. All reported: all ignored. 18/5/18 and I look out about 10pm and find local lowlife trying to hide by my car parked using her phone, again texts, then she runs off, I get this photo: she ran to 22, I have no idea who she is. I also appear to be Pat Morley married to David in The Old Coach House so I need to know when you were told I had ceased being Carol Woods and was Pat Morley of Bath Mill Lane. Are payments made to her/those 2 to pretend in that lunacy? Any reasonable minded person would suggest they do not act for free. I also need all data ditto all above in regard to 3 Bath Mill Lane, Sue De Lecea, who is driven about as me pretending to be picked up after I park, and driven about by someone, there are often sleazy staff hiding in cars parked along Bath Mill Lane who pretend they are linked to me in whichever way their corruption and delusions allow. I have their photos: please ask. THERE WERE NO CUSTODY RECORDS FOR ME AGAIN TODAY NO CD OF INTERVIEW FROM 31 JAN 2018 AND NO PHOTO OF MY CAR AT MANCHESTER AIRPORT WITH WG03 DMW RED AUDI IN BACKGROUND WITH DALTON FROM 45 FELL VIEW AND BLEASDALE FROM 2 HALL DRIVE ON 5 OCT 2015 AS APPARENTLY SHOWN TO DALTON END AUG 2016, I DO NOT REQUIRE A PHOTO OF MY CAR AT MANCHESTER AIRPORT OF JUNE AND JULY 2016. I ALSO RECORDED WG03 DMW RED AUDI; I DID NOT SAY ANY OLD RED AUDI SUCH AS DE61 DBO, HE IS NOT ON MY PHOTOS STALKING ME ALONG THE M6 ON 5 OCT 2015, HE WAS NOT THE REASON I BROKE MY JOURNEY TO LIVERPOOL AIRPORT AND SENT FAXES FROM KIRBY LIBRARY TO RECORD THE STALKING. Data now records mostly your desperation in cramming years of CORRUPTION, THUGGERY, FRAUD, ID THEFT and more into events of a few hours AGAIN. From Ms Carol Woods 28 Fell View LA2 9RP. I report wasted police time approx 1 26pm today along Moor Lane AS USUAL when I am seen ILLEGALLY via the ILLEGAL GPS on my car where your Gestapo confirm they see me BUT as if SX03 SUE car is MINE. 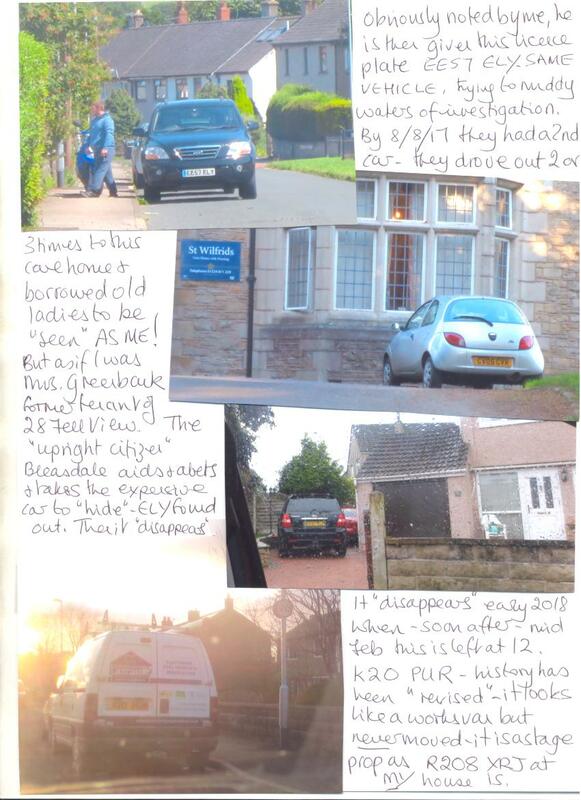 That car used in serious FRAUD from 4/2/14 at Flat 15 Penhale Gardens with a seedy old thief and worse EDITH CURWEN who posed as MY DEAD MOTHER and SX03 SUE the white haired old doxy sent to pretend she dealt with the sale of MY house as if that CURWEN was me and “too ill” to live in MY HOUSE. 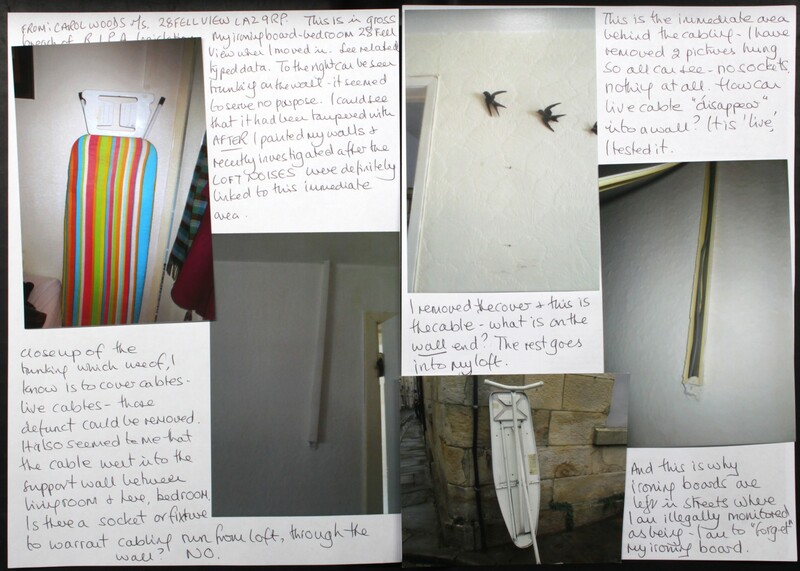 CURWEN 24 Fell View and their FRAUDS and worse in theft of £50.000.00 are not related to that old thief in Flat 15 BUT finding a CURWEN to revise that history after I left Flat 3 on Penhale Gardens was ONE reason 28 Fell View was found for me and was a nail in the coffin of the elderly lone lady then in 28 who “disappeared”. I reported SX03 SUE and provided photos from 4/2/14 and then found where the old doxy lived and YOU then tried to claim she was me. 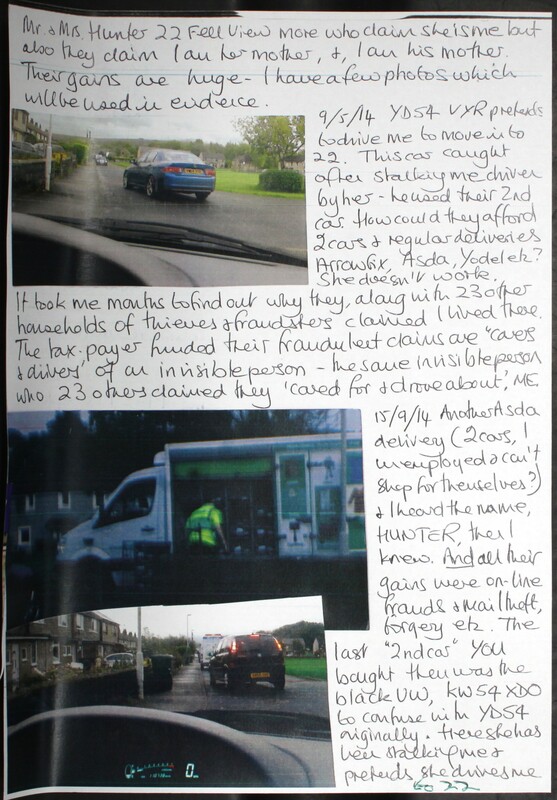 In 2017 the car was then, after being driven about by a thug transferred to a younger woman who seems to have dealings (or pretence) to a pizza take-away on Moor Lane which your Gestapo was sent to confirm I was there as was that car and my RED car is apparently invisible. She is only there about once every 10 months when you have what you think of as a “plan” in action. Why is the pizza takeaway significant? 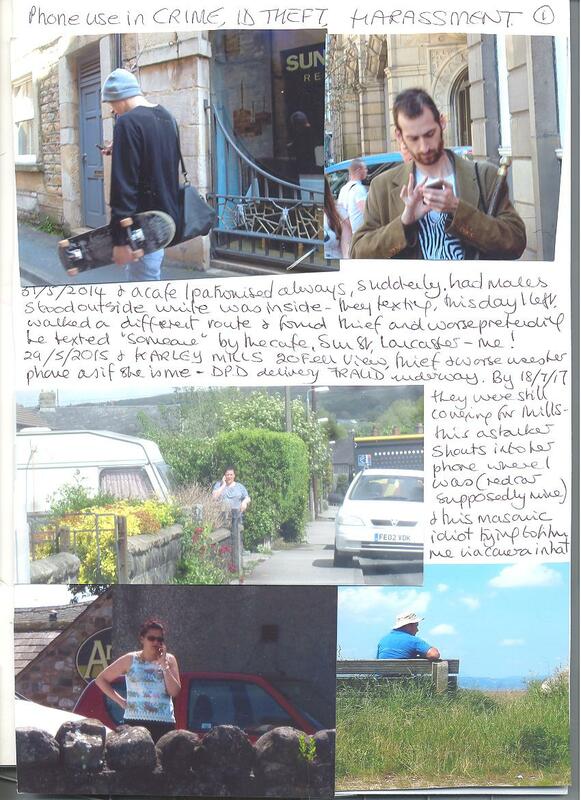 For those who will be sent this; 2012 and murderous scum KENNETH NICHOL in caravan 2 at 298 Oxcliffe Rd Morecambe when I rented caravan 1A there attempted to murder me by causing a gas explosions AND more but he was ONE repulsive bully who pretended to be also linked to me for his claims in FRAUD. In that NICHOL drunk driver, reported and supported by Gestapo also worked part time in a pizza takeaway while claiming benefits. Thus the lunatics have added ALL that again and made it today’s farce. On camera yet again. In that the use of BLUE and WHITE MINIS which data has been sent out with photos often and a blue Mini with a white one was also just there to harass, PE58 OVZ and DG62 LFT resp with MY DETAILS clearly having been given or else they would not know who to stalk to harass. Then the lowlife thief and fraudster AGAIN from 14 Fell View McGUIRE who is ANOTHER to claim to be my daughter AFTER a VICKY McQUAID druggie and thief was used to be my daughter in 2013 at 298 Oxcliffe Rd. McGuire long-term unemployed thief and stalker, used again in stalking to pretend she dropped me off in Lancaster, RX02 TLU and also again on film. This organising of such is wasted police time which is a CRIME. The use of the deranged ‘Eileen’ and her 2 unemployable sons used in E-CRIME and on camera, and I note now she is me again with lighter dyed hair and not the dark RED she used when she was me in 2012, and onwards. That troll HAD to be given MY details again so she could know where to stalk to harass and pretend thus she was me now with her thin, very short grey hair dyed trying to be my colour. These are all data protection issues and I have warned you about the new laws which are in force. She was told to wear the lilac that YOU had AGNES JACKSON, thief and more from 26 Fell View wear 5/9/14 when shouting into her mobile phone posing as me on excellent photos, and then to aid and abet Jackson YOU bought a similar garment for JUNE F WIKLLIAMS thief and bankrupt and worse in 30 Fell View so she could shout into her phone and pretend, while wearing that lilac creation, to be me. At least 24 tenants round Fell View helped to bully out the former tenant of 28 and in which she died. In that YOU had today a dollop of a male hiding end Fell View with car M33 TMJ he then to dart up the small steps to the FUNERAL PLACE newly built and opened and PRETEND by standing at the top of the steps that somehow he was linked to me and MY DEAD MOTHER. For the record: 2011 I found that MY mother’s death records had been deleted from records as if she was not dead. No one helped with that although it was confirmed to be fact. Thus the Gestapo had the FRAUD and worse all PLANNED to say I was MY dead mother thus she was not dead. They then made the landlady at 298 Oxcliffe Rd LA3 3EJ when I rented caravan 1A, (4/3/12 – 1/7/13) Mrs MARGARET MIDDLETON into me as my dead mother with Mrs Middleton the approx age my mother would have been had she been alive. That proven with Gestapo ON CAMERA and sleazy local solicitor sent to harass me but say they saw me enter the DWP medical building in Lancaster on 26 June 2012 which they did not. Mrs Middleton had attended in the morning as if she was me as my dead mother claiming for “carers”. I found what they were up to, went to Morecambe police station, explained what was taking place, (a DWP fraud) and had one decent officer sign a page saying I was there and when which meant I was not in any DWP centre anywhere. Thus I went in the afternoon with photos of Mrs Middleton which was when the Gestapo and solicitor thought if they stood about to confirm I was seen with Mr Sleazy to pretend he had accompanied me, then the morning fraud would not be found out. It was, I took their photos and left: I did not go to inform the DWP until much later so three was no confusion who was whom. Thus since then the lunatic fringe of the Gestapo have tried to say I am other DEAD people who they pretend are not dead. Thus Mrs MARGARET PORTER Flat 3 Penhale Gardens a lady bullied to dead with assets looted: apparently she was my mother so I could use her bank accounts which other lowlife posing as me used such as SHIRLEY RYCROFT in Flat 4. Rycroft was not the only one but she was a good example of a parasite thief and fraudster and impostor. Then I move to 28 Fell View and find EXACTLY the same but doubled as the elderly lone lady from 28 had “disappeared” (I do my homework) and Mrs MARGARET Peck from 33. Which is why 33 has been used for much lunatic action since. I also note the farces at 33 Fell View today and remind you that SSE supply all gas and electricity to council properties, not any old gas firm you can recruit from the Lodge. For those CC this I can now confirm that 1021 persons have moved into 33 Fell View LA2 9Rp without any moving out. The person named on the electoral register Mrs M PECK is a MISSING PERSON reported but ignored. In that DK51 HVL a roughneck like McGuire stalker and thief, fraudster also pretending links to me as if I was Mrs Peck in 33 Fell View and the related blue badge frauds (found out and on film) ran away in 2017 and was replaced by a thug in black Vauxhall Astra DK51 WHO which car has spent untold days hiding behind 31 Fell View intending to stalk me when they6 see my car drive from 28 as that thug now claims to be linked to me as driving me BUT now he uses 39 Fell View for his frauds with O’Conner who claim to be me. In that MY guess is that he pretends to drive about the mother of one of the O’Conners in a repeat of the thieves and fraudsters in 22 Fell View HUNTER who claimed for a year after I moved to 28 that I was Mr Hunter’s mother and lived with them which was how they had 2 cars and lived way beyond their 50% unemployed means. After the year and found out, they pretended I was her mother and then after that was reported she pretended to be me. This is O’Conner now in REVERSE: she in 39 pretended to be me for years, married to Mr O’Conner and they with a SECOND ADDRESS to aid that as if they were WOODS in one address. Now they want to claim the MISSING LADY IN 33 is the mother needing to be driven about but not by DK51 HVL small silver grey but in DK51 WHO a large Vauxhall Astra. And that person is ME. Both O’Conner’s long term unemployed; she provided with a yob in 2015 to be a son for half an hour and he provided with a rough female in 2017 to be a daughter as they have no family and I have. 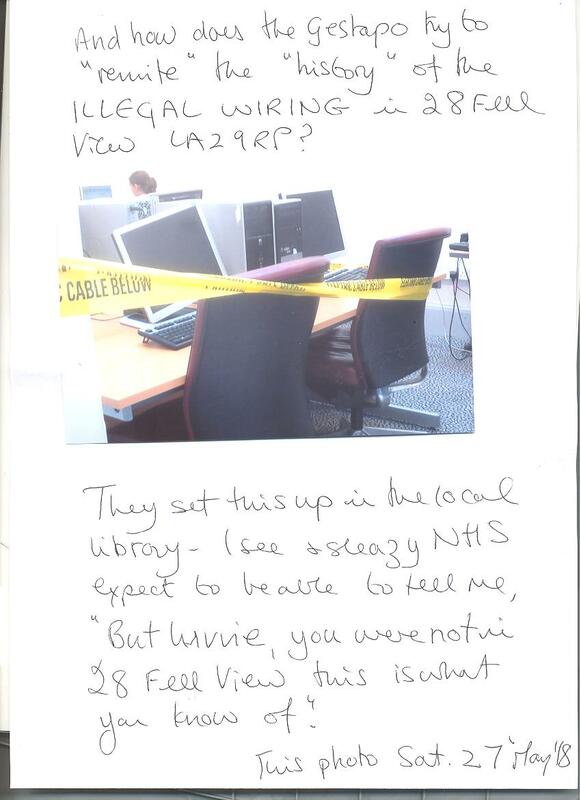 Today the electrical farce in the library is seen to be that. I have taken a photo: the Gestapo are annoyed about the FACT that they cut off my electricity in the month of the Beast from the East and deleted my details from SSE records so SSE could not call to see what went on. MY email asked how SSE kept my gas going if they had no records of my electricity. The Gestapo don’t cut off my gas as they do my electricity and water trying to force me into submission. Thus today that gas farce at 33 to pretend SSE had not supplied my gas when ALL council properties are SSE customers. Thus the lunacy in the library cutting off some computer with ELECTRICAL DANGER TAPE in brainwashing is pathetic. The computers are LINKED to each other on a circuit, if one is dangerous they all are; danger is not isolated to 4 computers from 17. Unlike my 28 Fell View of course as all are separate as we all pay our own bills; an idiot can work that out. What was the “trap” today where the bullying thugs had an “idea” in place to “see me off” IN ARREST then claims I am mentally ill? They guessed rightly that I would use the scanner in the local library and left most conveniently ANOTHER library card complete with log in details right where I could not miss it. It was a card for a child which was obvious so that is their lunacy in thinking they can abuse ALL the children they have and then scream I commit E-CRIME using a child’s card in Masonic inversion lunacy. I passed it to a man sat next to me (the witness to claim he was sat next to me so had seen me using the card), “Is this yours?” Apparently not, he placed it by his computer. The document I scanned today is not to be sent out yet but shows some of the O’Conner frauds in having cars pretending to be me, is FRAUD. I thus send this as another WARNING that thuggery harassment, collective and organised has to breach the tougher data protection rules. For those who will not know why the child’s card with log in details was significant (the Gestapo do this with other cards such as 2 weeks ago when the card owner left her card and her screen ready to use and walked off as if I was stupid enough to use her registration for my emails), the Gestapo watch for MY registration to show up and then know which computer I am on within the circle set up of 17 computers (in the main library) and thus can send their lowlife in, unemployed with nothing else to do to sit as close as possible to me and thus somehow make what they type and print off into something that is mine. And of course, intercept all I do, or at least access it all hence the panic now with my SSE power cut off earlier this year and deletion of my records so that SSE could not call to check the matter. If I could use a different log in, they would not know I even used a computer and I might get an email past them without them knowing.